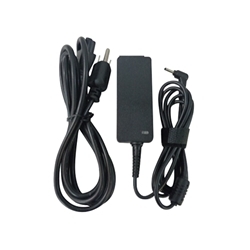 Description: New 3 prong high quality aftermarket laptop ac adapter charger & power cord. 19V, 2.1A, 40W. Compatible Part #'s: PA-1400-24, AD-4019SL, BA44-00272A, AD-4019P, PA-1400-14, AA-PA2N40S, AD-4019W, AA-PA2N40L, BA44-00278A, AA-PA3NS40/US, BA44-00279A, PA-1400-14. The title of this item is misleading: "Samsung PA-1400-24 Ac Adapter Charger & Power Cord 40W 19V 2.1A". It is not the original Samsung model, it is an aftermarket replacement. The specs match the original, but the connector does not snap into the charging connector, it just slides in and can easily slide back out. I thought I was purchasing the branded original, could have bought this one cheaper from Amazon. But it works, and delivery (expedited) was good. Update: the electrical specs match the original Samsung unit, but the connector is not correct: the center hole is too big so it does not grip the center pin of the computer's power port. Only way to make it work is to apply side pressure to the connector so it maintains contact.